Bamboo shoots are new growth from the universally abundant bamboo plant. Contrary to popular belief, bamboo is not wood; it's a grass. However, this doesn't mean you should worry about bamboo flooring durability. 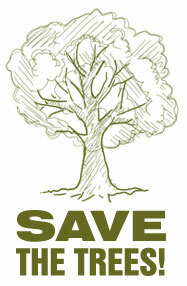 Bamboo is actually a choice building material thanks to its strength, durability, and eco-friendly properties. Unlike most trees, bamboo grass matures and can be harvested in three years. While bamboo grows around the globe, most of the plants that are used for flooring come from China. The bamboo shoots are harvested within 3 to 6 years; these shoots are mature enough to provide optimal bamboo flooring hardness. The bamboo is put through a splitting and sizing machine to be crosscut to identical lengths. The internal knots are removed and the outer skin is peeled. To remove insects, grime, and sugars, (and additionally, to prevent future decay), the bamboo is boiled in hot water to which preservatives have been added. 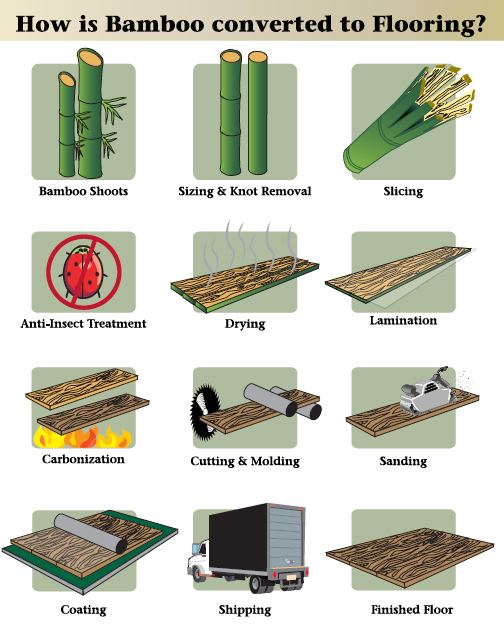 One of the most crucial steps in the manufacturing of bamboo floors is allowing the bamboo to air dry and then kiln dry to an 8 to 14 percent moisture level after the anti-insect boiling water bath. The drying process usually takes about 5 days. Strips of bamboo are set perpendicular to face veneers and then laminated together using adhesive and a two-dimensional hot press machine. The source of heat is steam, or high-frequency heat. The direction in which the strip of bamboo and the face veneers are laminated in, determines whether the flooring is vertical or horizontal. The process combines bamboo strips into large boards of strengthened flooring material. Carbonization of bamboo floors is performed by heating the bamboo using steam treatment in a closed container. The darker color is a result of the sugars in the bamboo caramelizing due to the high heat. The longer the bamboo is allowed to process, the darker the color will be. However, the carbonization process may weaken the strength of the bamboo flooring by 10 to 30 percent. Alternatives to carbonization are bleaching, a process in which the bamboo is brushed with bleaching agents, and painting or staining the bamboo to attain the desired color and luster. The bamboo is cut to the desired length and width using a wood sawing machine. The large boards of bamboo are inserted into the machine, and from therein, they are mechanically cut into planks. Machines are also used to mold the bamboo into desired shapes and finishes. The bamboo planks are sanded using a wide sanding belt to smoothen and level the surface boards. The sanding belt provides a smooth finish to the bamboo floors, which are thereafter, inspected, packaged, and exported.